Two things. Yesterday I went to Skibbereen. Today I watched an episode of Who Do You Think You Are? featuring Lisa Kudrow. For people who study Irish history, Skibbereen (a village in west Cork, about 50 miles from Cork city) has become a stand-in for all of the worst parts of Ireland during the 1845-52 famine. In part, its development as an archetype for famine Ireland comes from the fact that during the famine, residents of Skibbereen – particularly Dr. O’Donovan and Rev. Traill – worked hard to let local elites and government representatives in Dublin know about the extent of destitution in their district. Their many letters made Skibbereen famous as a place where scenes of horror were plentiful, and diarists and artists on tours of Ireland in the 1840s and 1850s would often stop at Skibbereen to see “real” Irish destitution. In addition, the most iconic images of the famine today – like the “Boy and Girl at Cahera”produced for the Illustrated London News in February of 1847 – were drawn in Skibbereen and its environs. Given the iconic place that Skibbereen holds in the imaginations of historians of the famine, and the central role it played in nineteenth-century accounts of suffering in Ireland, it was hard for me to imagine the town at all. I think I was expecting something greyer, and more sinister than the cheerful and very typical Irish streetscape that I found. There is a museum devoted to the famine, as well as a walking tour that takes you to the town’s soup kitchen, the site of the old poor house, and the dispensary – but today these are just eighteenth and nineteenth-century buildings, like any other less meaningful edifice on any street in any small Irish town. I think that I had been expecting to feel the scale of the tragedy in some way. I knew, I had read about, people dying in the streets of Skibbereen – in some of the very spots that I stopped. I knew that the poor house turned people away, and that those lucky enough to get in were packed in so close that there was no room to move – but I simply didn’t feel the chill of that knowledge as much as I’d expected to. I looked for it too at the Abbeystrewery Graveyard, site of a burial pit into which it is estimated that 9,000 people were buried, coffinless and nameless, during the famine. One boy was so ill that his mother thought he had died, and buried him alive in the pit. He was able to dig his way out through the corpses, but remained marked for life both mentally and physically. The physical injury has been attributed to the fact that his mother broke his legs in order to get him into the only coffin available. The famine plot is the lighter green patch at the bottom of the hill. 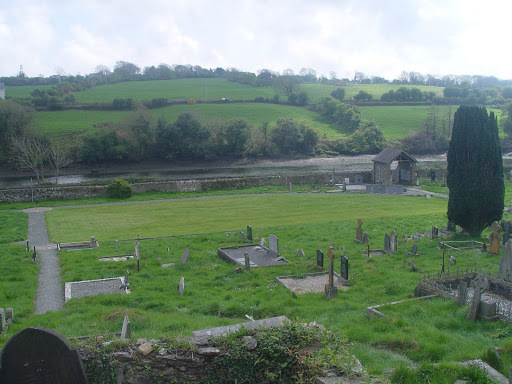 The graveyard in Skibbereen is an eloquent, and muted testimony to suffering. The graveyard is built on a hill, with most grave markers precariously perched on whatever ground is available in the midst of rocky outcroppings. The only truly flat area, which would be the easiest and most likely place to put new graves under other circumstances, has no graves, and marks the plot where the famine pit was. It’s not a shocking memorial. There are no accounts of abject suffering, or of people dying of starvation – I think that the people who designed this memorial assumed that no one would visit the graveyard without some prior knowledge of the famine and its impact. But I also have to imagine what it must be like to live today with the responsibility of tending to the historical legacy of Skibbereen. The town as a whole seems relatively ambivalent towards the famine – which is totally understandable. Who would want to actively remember that the place you live is famous for suffering? I don’t think that I had anticipated the fact that Skibbereen was a real place. I had fetishized the suffering so much in my head that it had almost become divorced from reality. There’s an old chestnut of a Stalin quote (supposedly) that’s something like ‘one death is a tragedy, one thousand deaths are statistics’ [See note] that I think rings true for historians of disaster. It was almost impossible, for me at least, to get my head around the scale of the suffering as a consequence of the famine – so much so that when confronted with an actual place and actual graves, all I felt was disconnect. By way of contrast, on the episode of WDYTYA? that I watched today, Lisa Kudrow learned that her great-grandmother had been forced by SS officers to stand at the edge of a pit with two other members of her family, and had been shot and then set on fire. That was evocative, and tear-jerking – everything I thought I’d feel in SkibbereenSkibbereen does an excellent job of honoring its past while not becoming mired in re-enacting tragedy – and I am working, as someone who studies crises to keep the epic scale of disasters and the poignant narratives of individual sufferers in my head – and do justice to both in my work – at the same time.